In the seventh inning of tonight’s Blue Jays-Braves game, Jason Motte struck Kevin Pillar out to end the inning on a quick pitch. Pillar took issue with Motte’s tactics and yelled something indiscernible at the mound, immediately drawing a warning from the umpire. Both benches cleared and milled around before dispersing. 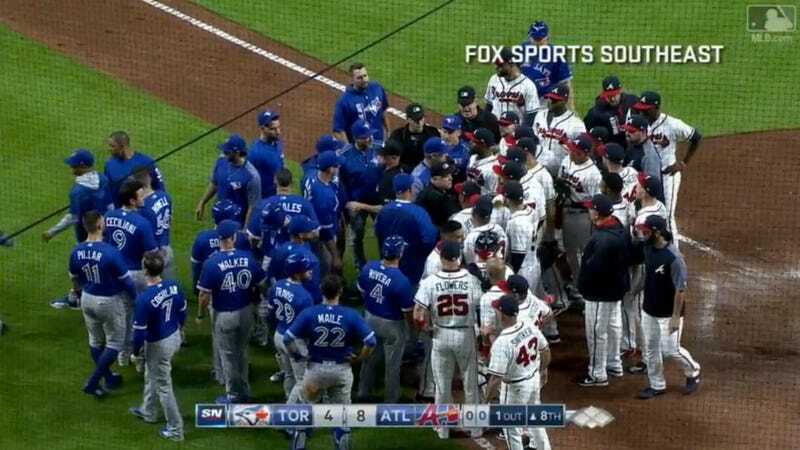 Next time around, Jays slugger Jose Bautista knocked a dinger to left field and made a point of stunting a bit by flipping his bat, apparently in retaliation for the Braves puffing their chests at the Jays after Pillar puffed his chest at Motte (baseball beefs are so dumb). The benches cleared yet again. The Jays are in town for one more game tomorrow, and if we are lucky, this simmering beef will turn into a fully cooked beef.